Wooden teething toys are a great, all natural way for little fellas to work those new chompers. One of my favorites (and Baby Brother's favorites, too!) 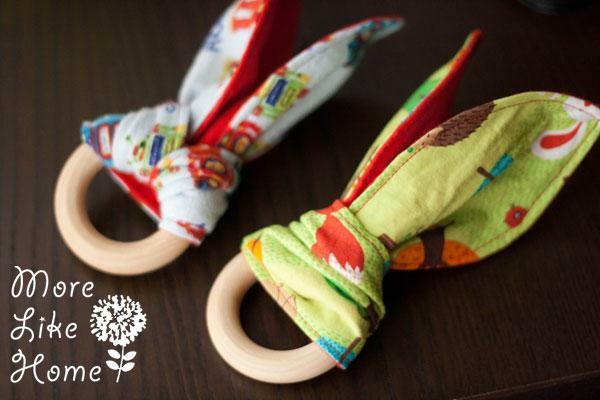 is a taggie toy with a wooden teething ring. The wooden part is great for baby's gums and the fabric taggie adds textural interest and gives baby something to hold on to. They are perfect for baby shower gifts or stocking stuffers. And the best part is they are so easy to make! Today I'll show you how I make the taggie rings and also how to make an all natural beeswax & olive oil sealer. Let's get started!